What makes a coral reef resilient? On this beautiful island, find how we can help reefs survive climate change. Help researchers learn what makes coral strong, which could have a hand in saving reefs across the world. Coral reefs live in a stressful world. Thanks to climate change and carbon dioxide emissions, they have to deal with rising sea temperatures and increasingly acidic ocean waters, which make them more susceptible to disease and death. The coral reef off Little Cayman Island tells a story of survival in the face of these challenges. It’s one of the few reefs in the world to recover after the 1998 El Nino year, which caused record-high sea temperatures around the world and took a huge toll on reefs (some countries lost 90% of their living reefs). What can Little Cayman’s reefs tell researchers about the future coral reefs around the world? Help find out by snorkeling off this remote island, surveying the types of coral growing in specific locations and the environmental conditions that support coral the best. You’ll also learn about, and observe scientists working in a shallow ocean “nursery,” where researchers are practicing coral gardening: growing new coral from fragments taken from the reef, then replanting those baby corals into the wild to boost reef recovery. Some researchers predict that reefs won’t survive beyond the middle of this century because of rising ocean temperatures and overuse by humans. The reef around Little Cayman Island tells a story of resilience. Corals get their vibrant colors from tiny algae that live within them. Through photosynthesis, the algae provide the food that keeps corals growing. But in water that’s too warm, the corals eject the algae, robbing themselves of nutrition and turning white—hence the term “coral bleaching.” Without algae, the coral dies. Coral off the Cayman Islands. The history of coral bleaching off Little Cayman may contain lessons that could help protect reefs everywhere. In 1998, the world experienced an El Nino year, which meant that parts of the ocean around the world became warmer than usual. One result: a massive bleaching event that wiped out reefs around the world. Little Cayman’s reefs did not fare well—40% of the coral died. But then something unusual happened: the reefs recovered. By 2012, researchers had recorded an increase in coral coverage, nearly back to its former state. But why? And how? You can help researchers understand what makes some reefs more resilient than others. You’ll also help them find ways to protect rare and endangered species of coral, with the goal of preserving the rich diversity of life in the world’s reefs. Little Cayman is the smallest of the three Cayman Islands, which sit in the Caribbean Sea just south of Cuba. With fewer than 200 residents, it’s also the least populated. This island provides an excellent research environment because, with its low population, human stressors like overfishing and runoff pollution are not an issue; researchers can isolate the impacts of global threats like rising sea temperatures and ocean acidification. More than half of Little Cayman’s surrounding ocean enjoys protected status, so it is teeming with more than 350 species of fish and 37 species of coral. There’s a lot to see out of the water too, including the western hemisphere’s largest breeding population of red-footed boobies. In your free time, you may have a chance to bike, kayak, and snorkel (you’ll also do plenty of snorkeling during research), or simply enjoy the sunshine on one of the island’s most beautiful white-sand beaches. Day 1: Arrive in Little Cayman. Day 2: Morning: orientation and snorkel. Afternoon: research, island tour. Day 6: Final research, beach picnic lunch, wrap-up discussion. Snorkel and survey coral reefs. You’ll note what species of coral grow where, with a focus on rare and endangered species. You’ll record coral species and color, and photograph the corals. You’ll also record the abundance of fish and sea urchins.. On a floating platform nearby, teammates will take turns recording GPS coordinates of reef features, which will eventually help create a map of the island’s entire reef system. Snorkel and record environmental data. While coral mapping is going on, some snorkelers will take measurements and record data such as water depth and temperature; these variables help show what conditions correspond with different species and reef health. Learn about Gardening in a Coral Nursery. In the nursery, essentially a greenhouse set up in shallow water, you will help researchers build the structures used to grow new staghorn coral (an important threatened species). You’ll also learn about the growing and transplanting process. Please note that the nursery is at a depth that necessitates scuba for its management. Coral outplanting. You’ll receive training on methods for handling fragments and outplanting coral. You’ll prepare the reef for outplants, photograph outplanted corals, and measure coral fragments that have been outplanted to track their growth. Coral Recruitment. You’ll help record data on coral recruitment by locating colonies, recording GPS coordinates, and scrubbing algae off colonies (if necessary). Additionally, you will take coral tissue measurements and photograph skeletons. Data analysis. On dry land, you’ll enter the data you’ve collected and compare photographs of the reef in the past and the present to track changes over time. In the evenings, you’ll hear talks from visiting scientists and island residents or enjoy the beauty and tranquility of the island. Some nights will also feature a bonfire or a barbeque. Volunteers collect data on the shore. As a geologist, Dr. Manfrino takes a long-term perspective—millions of years long—on the past and future of coral reefs. She started working on Little Cayman Island two decades ago, and established the Central Caribbean Marine Institute in 1998. Sunset Cove is on a sheltered lagoon and will be home for summer teams. This hotel style accommodation hosts two people per room. The Little Cayman Research Centre will be home for the fall teams. This complex has dorm-style rooms that accommodate up to six people, as well as a kitchen, classrooms, and a detached, sustainably designed bathroom and shower block. A local chef will prepare all of your meals. For breakfast, you can enjoy cereal, toast, bagels, yogurt, and fresh fruit. Lunch typically includes fresh vegetables, pasta salad or potato salad, sandwiches, or fried chicken or fish. Dinner has a variety of options, including ribs, spaghetti, and other classics along with fresh veggies. 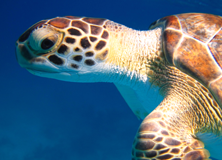 The Little Cayman Research Centre: your island home. My husband and I participated in this expedition in February 2019—it was an exciting and rewarding week. Everyone at the Institute was very genial and welcoming. The staff who worked with the Earthwatch volunteers are science professionals, but also education professionals. They had set up a rich and varied learning environment, and we spent the first couple of days learning a lot about corals and ocean health. Then we went over the survey methodology being used for this phase of the project and completed 8 surveys. The clear water and varied corals surrounding Little Cayman Island make a beautiful environment for snorkeling, and the preparation we’d been given in the study room added to the fascination. Our meals were tasty, clean-up went fast with so many willing hands, and CCMI demonstrates that sustainable buildings can be comfortable. In time off, we found that Little Cayman has a surprisingly good historical museum, nature reserve, and interpretive center even though the island is remote and thinly settled. The best part of the experience is that we came away seeing that the corals are not inevitably doomed. That’s energizing when we look at the many things we can do from our own communities to protect ocean health. If we could change anything about this expedition, we’d make it longer – 10 days or two weeks would have been even better! As someone who had the extreme good fortune of spending a decade diving mid-Pacific coral reefs back in the 1980's when they were relatively pristine, I have viewed the recent worldwide coral bleaching events with sadness and alarm. I am grateful that this project gave me an opportunity to feel like I could actually do something - to contribute in some small way to addressing this critical issue. We learned to identify corals, to assess their health, and to perform transects to provide a baseline snapshot of the overall health of the coral reef. Because the work was challenging and time consuming, I can now appreciate how difficult it would be for the project scientists to conduct all of these surveys on their own. So I definitely felt that the Earthwatch team was making an important contribution to the study. Also it was just plain fun to snorkel several times a day on lovely reefs all around the island. I had so much fun with the scientists, staff, and other volunteers and came away feeling energetic and inspired. Exploring coral reefs of Little Cayman was a fascinating experience. To swim with the rich diversity of organisms was amazing but to actually be involved with the research to capture coral bleaching, disease, and invasive species helped inspire my resolve to take action to protect and conserve precious ecosystems like the coral reef. This ecosystem is often referred to as the "tropical rainforest" of the sea and it's true! Thousands of species depend upon us to act as human stewards to conserve and protect this pot o' gold that shares our planet. I truly believe education is the key. Anyone who enjoys this expedition will be touched by the beauty and fragile existence that is a coral reef. This expedition inspires passion to protect this rare ecosystem through experiential learning. From learning how coral survives to swimming with sharks and rays, everyday is an adventure to remember! Every day of this Expedition was so full of adventure and every minute contained such fascinating things to see and learn. 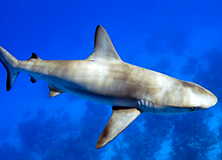 The waters around Little Cayman are beautiful and just teeming with cool creatures. I never wanted to leave the water, I could have spent the rest of my life snorkeling over those reefs. Time on land was amazing too, Katie and Tom and the team at CCMI have created such a great educational program. They didn't miss any opportunities to treat us to amazing little lessons and discussions and talks that were fascinating and fun the whole way through. There is so much interesting research and conservation work happening on Little Cayman, leaving was hard because it felt like there was so much more important work to be done, and you get to experience it all while staying in Paradise. I cannot recommend this Expedition enough. This expedition was a real eye-opener for me. I had heard of coral reefs dying but never really thought much about what the impact might be for the health of the world in general. The education we were given was very thorough and made a believer out of me! The flexibility of those in charge allowed us all to fit in and assist in the research to the best of our varying abilities. Every day was truly enjoyable. I had an amazing time on my Earthwatch expedition. I was involved in research that really interested me and was exposed to an environment where a passion for learning is highly encouraged and fostered. On top of the educational aspect, I also met lots of great, interesting people and formed a strong bond with my teammates. 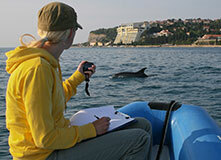 What can we do to make the Adriatic Sea safer for dolphins? 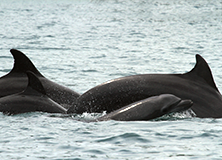 Take to the waters in Slovenia to help this charismatic mammal population.